The lovely and incredibly sweet, Jenn has tagged me for a meme that asks what 5 things you do to stay mentally healthy. This is certainly a great thing to think about, especially during these darker days of winter and the stress that can come up for many around the holidays. Creative Expression: Clearly this is an important one for me, as you can see by the projects I run here and the title of my blog! Daily creativity, in whatever form it takes (dancing, painting, collaging, writing, cooking, crafting, photographing doodling) is such an important part of my life. It helps ground me, helps me release the internal backlog, and helps me be a better person. Snuggle: I am especially fond of my 4 kitty cats and I get daily love from them in the form of face pushes, cat massage sessions, and sweet purrs that warm my soul. And at night, the hubster and I happily share a full-size bed where we (and usually at least one cat) can be found snuggling up. Laughter: Laughing is so important to mental health. The hubster has a great talent for making me (and everyone around him laugh), I also love listening to comedy on the radio, and watching shows like 30 Rock and the Office to give me a good, hearty laugh. My laugh is ridiculously loud and people can usually find me in a crowd because of it. Scent: I love showering with a good-smelling shampoo. I also love the smell of cocoa in the winter, of chicken noodle soup, candles, pomegranate lip balm, a home-cooked meal, lemon dish washing soap, etc...I think good smells can lift you up. It's a small, simple thing that's a part of my everyday life that I notice and love. Movement: Some kind of movement or exercise is important for my mental health. I've fallen out of doing daily yoga, but want to get back to that as soon as possible. But even if I'm not on a regular exercise regimen, I keep moving through doing chores around the house, moving and dancing while I create, taking walks with my ipod, and chasing the hubster around the apartment. How bout you? What are your five a day? I'm not always great at tagging or at responding to tags, so if I tag you, feel free to do it or ignore it. And if I don't tag you and you'd like to do it, by all means, go for it! Today, after running around to the post office, other little errands, and packaging up things to send out, I spent the late afternoon playing with tempera paint and charcoal on drawing paper just to play with some internal questions and see what might come up intuitively. I'm still working on them and may or may not share images here when I'm done. It's good to play with no end product in mind from time to time and I enjoyed the process. I played some good tunes in the background and let paint drip and pour. I smushed it around with brushes, sponges and spatulas and looked to see what came through in the colors. I brought out bits of what I saw with a stick of charcoal. It felt good. And then the hubster came home and I washed my hands so we could share a yummy dinner. All in all, a good day. Hope yours was a beauty! p.s. My calendars are all sold out! Thanks so much! I'll be sure to print more next year and to get them ready a little earlier too. If you're looking for some gifts, I still have my free shipping offer going on at my art website through December 15th! All you need to do is enter holiday08 in the coupon section at checkout. My creativity over the past few days has centered on preparing calendars and some prints to ship off. You can see two of the large framed prints above. I've had fun personalizing the calendars with birthday art! I'm nearly out of calendars, so if you want one, now would be the time to scoop it up! I'm feeling loads better than a couple days ago. Still feeling wiped out and moving a little slowwwwwly, but then again, I always feel like I move a little slowly, so maybe I'm just extra slow. Ahem...Yesterday, I tried out a new commenting system that Typepad (Typepad Connect) is offering and then promptly took it down. It's a cool idea that allows you to have threads (comment responses) in your comment section, but the email notification system they have at the moment doesn't work for me. I like receiving comments by email that allow me to respond to the commenter directly and this new system doesn't allow that. Phooey. Oh well. Perhaps in a future version that will be an option. We had our first snowfall over the weekend. It didn't last, but I'm sure we'll have more soon enough. If you're feeling like bringing a little snow into your life, how about making some snowflakes? Tammy sent me a link to a virtual snowflake making site. So fun! Karen has made some amazing paper snowflakes (I love the one with bees!) and over at MayaMade, there is a great newspaper snowflake garland tutuorial. This Creative Goddess E-course with Leonie sounds like so much fun. I love her sparkly energy! Melissa's adorable kittens are getting bigger and cuter every day. I just want to cuddle em' up. Jennlui is doing a great new weekly challenge called Mantra Mondays. I love the mantra cards she makes! In January, Jamie is leading another online book group, this time with Gail McMeekin's book, The 12 Secrets of Highly Creative Women. I have read this book a few times already, but I'm planning to read along with Jamie's group too! 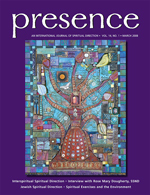 I've been loving Martha Beck's recent blog posts. They start here. Something about her writing just rings true for me in a deep, authentic way. I can see that she might not be for everyone, but who is? Me? I love her. I had the pleasure of meeting Susan Tuttle a couple summers ago at a little art party in Maine. She's such a sweetheart and so creative! She recently authored a book, Exhibition 36: Mixed Media Demonstrations + Explorations that looks fabulous and she's giving away a copy of the book on her blog, here! O.k., that's it from me for the moment. I recently got called out for being a bit of a night owl. It's true! But I'm trying to get to bed a decent hour, so that I'll hopefully get back to full health quicker. Hope you're all staying warm and healthy! CED2008 participants! Feel free to leave a comment on this post or use the widget below to link to a post (or posts) about your creative activities during the week of 12/8/08 - 12/14/08. To find out more about the Creative Every Day 2008 project, click here. The best ideas come unexpectedly from a conversation or a common activity like watering the garden. These can get lost or slip away if not acted on when they occur. 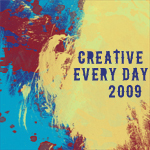 Here is the brand spankin' new button for the Creative Every Day Challenge for 2009! I had a lot of fun making the button by playing with photoshop brushes that I downloaded from BittBox. Feel free to grab the logo for your blog. And if you're interested in joining in the fun, check out all the details about the challenge here, and then let me know you want to join in by emailing me or commenting on this post. Be sure to let me know what blog you'd like me to list you with in the list of participants that will be kept in the sidebar. Or if you don't have a blog, (it's not required to have one to participate) let me know how you'd like to be listed. As an alternative, I can link to your flickr account, website, or simply list your name without a link. The challenge is meant to be low-key and a means of creating community and encouraging daily creativity throughout the year. As a new touch for 2009, I will be adding optional monthly themes (optional meaning, you can use the theme as inspiration for your own creating or ignore it) and interviews with creatives. I'm super excited about 2009! p.s. Since there a lot of comments on this post, there is more than one page of comments below. So, if you don't see your comment, just scroll down to the bottom and click the little arrow to go to the next page. Sometimes hitting the back button after commenting makes a comment appear twice. If this happens to you, don't worry! I can always delete the extras later. If you have any trouble leaving a comment here, just pop me an email (a link to my email is in the top left corner of this blog). As I get to them, I'm putting the list of participants up in the right sidebar under the CED 2008 participants. On January first, I'll remove the 2008 list and the 2009 list will be right under the CED button. If I were a cat, that would be me over the last few days, under the covers like my cute Sadie. My head feels better resting as it is heavy with mucus. Gross! O.k., I'm going to try not to to get into the less than pretty details of my cold. My bff reminded me today that it's been awhile since I've been sick and that's quite true! I used to get colds far too often and it's been a long time, so I'm pleased that it's been a long stretch in between. Hopefully, this cold will pass quickly. I managed to get out to the grocery store which was not so fun, but I had a craving for butternut squash and I needed tissues, so I went out and it was quite nice out. I also got some beautiful new art postcards in the mail and I'll be sending one out to everyone who orders a calendar. They feature the Lady of the Lake painting and have lovely rounded corners which I'm just loving at the moment. I'm wishing I felt better because I'm bursting with ideas, just low on energy. Re-thinking the Creative Every Day Challenge has me super excited and I know it will be a great year, full of creativity and great connections, inspiration and lots of fun. And PLAY! Yes, play. More on that later. Perhaps this cold is my body's way of telling me to take a little rest after the rush of AEDM. It can be hard to relax this time of year. Despite the fact that I feel like the holidays are about family and not the gifts, it can be stressful thinking about how to handle gifts, especially in a large family. And all the travel and family time, while wonderful, can be draining for my introverted self. How do you make the holidays a fun and relaxing time? I totally love this fabric advent calendar that my bff created. She had family members create items to put in the little pockets by having them draw on shrinky dink plastic. What a cool idea!! I love to see crafts that families can work on together. Although this isn't a holiday piece, how amazing is this family-decorated IKEA chair from Our Artful Life?! Love it! And if you're looking for something eco-friendly, check out this diy re-cycled shopping bag turned into a bow on Creature Comforts! The Tar-jay bag makes for a great Christmas-y decoration too. There are so many great holiday crafts out there. I'm particularly drawn to garlands made from paper or felt at the moment. How bout you? Ugh. I haven't had a nasty cold in so long and oh boy, it sure does make you appreciate your health and general well-being when you feel like mud! I'm currently in bed, but I just sent out my art website monthly newsletter to announce my calendar (see yesterday's post) and I've also added the calendar to my website here, so I feel like I did some good work today. And I've got a build up of cool links to share, so here we go! Bernie Berlin at A Place to Bark and Meow is trying to get her rescue dog, Bean elected as the first dog to the white house! Go read Bean's story and comment to help get Bean noticed by the powers that be! Hanna has a great post with links and info about pens. 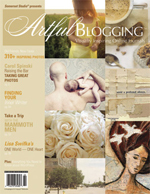 I love reading about art supplies! The super sweet, Bridget Benton has a new etsy shop open selling her adorable buttons with messages like "Make Stuff!" Love em! Bridget also teaches awesome classes like "Printing with Junk" and she's shared some pics of that class on her blog here. Now this is right up my alley, this post on the blog, unobstructed creativity, is titled Inspiration Explosion: 14 Rousing Resources For Your Creative Explorations. There are some great ideas there and lots of links to get lost in. 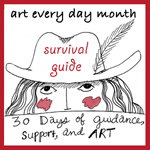 Aritst, Alicia Tormey, has a helpful blog post about how to get motivated as artist. Via Amy Crawley's twittering. O.k., that'll do for now. Hope you are all well! I received a new sample copy of my calendar today and I absolutely love it! I hope you'll enjoy it too. 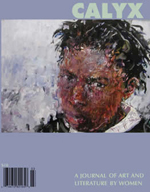 Above is a snapshot of the cover, below there is a snapshot of the January spread and one of the back cover, which shows a thumbnail of the 12 pieces of art that are featured. The calendar is about 11"x17" when open and it has a hole in the top for hanging purposes. The colors are gorgeous and vibrant! The calendars are available for sale for $29.99 (plus shipping) and quantities are limited, so please order as soon as possible! You can use the button below to purchase with paypal (a secure way to make purchases online.) When you purchase, let me know your birthday (in the comments section on paypal) and I'll draw a little something on your special day if you'd like! If you have any questions, feel free to email me. Sorry, the calendars are sold out! I had the idea for this one when I saw the Inspire Me Thursday theme for this week, "table." I started it yesterday by using fluid acrylics on watercolor paper that was wet. I painted over it with acrylics and a bit of ink. It makes me smile. I'm calling it, "If the Moon Came to Dinner." and it's about 9"x12". Thanks so much for sharing your thoughts about AEDM and CED! After I read a bunch of your comments last night, I sat down with my sketchbook and started writing and sketching ideas for the coming year. I'm very excited about using a monthly theme and doing interviews with creative people. If you have any ideas of people you'd like to see interviewed about their relationship with creativity, let me know! My calendar is nearly ready to go! I got a preview copy today and I'm loving it! I'll post more about them and how to purchase one tomorrow. I've got a cold, blah! It's time for some soup! AEDM has come to a close for the year and the year 2008 is quickly coming to an end as well. I'm thinking ahead to 2009 and wondering about how to approach the challenge I created last year, "Creative Every Day 2008" (CED 2008). 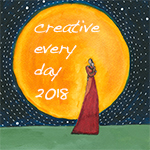 I think a lot of folks get a bit confused about the differences between "Art Every Day Month" (which I do every November) and the year-long "Creative Every Day 2008" challenge, so I'm looking for some suggestions about how to make the CED challenge something clearly separate. I like the idea of using the widget I used for AEDM, for the weekly CED posts and continuing to use the CED flickr group for folks to post images on. What else would you like to see as part of "Creative Every Day 2009"? What would help you bring creativity into your every day lives? Would you enjoy reading interviews with creative people? A monthly challenge or theme? A newsletter? Should I change the name to make the differences between the challenges more clear? I'd be very interested in hearing your thoughts! For me, the CED challenge is much more loose and flexible. I don't post about it every day like I do for AEDM, but I do think it helps keep creativity as a focus as the year continues. Let me know your thoughts by emailing me or in the comments below. And many thanks in advance! CED2008 participants! Feel free to leave a comment on this post or use the widget below to link to a post (or posts) about your creative activities during the week of 12/1/08 - 12/7/08. A creative train of thought is set off by: the unexpected, the unknown, the accidental, the disorderly, the absurd, the impossible.